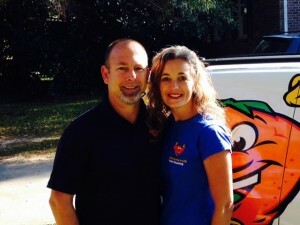 CitruSolution of Monroe, GA is locally owned and operated by Steve and Janis Williams. Steve grew up in Helen, Georgia, and graduated from LaGrange College with a Bachelor’s Degree in Psychology. Janis grew up in Savannah, Georgia, and graduated from Valdosta State University with a Bachelor’s Degree in Business Marketing. After meeting, falling in love, and getting married, Steve and Janis made their home in Social Circle, GA. They married in November 2000 and have four children. After owning a landscape maintenance company for 13 years, Steve and Janis were ready for something different. He was introduced to CitruSolution in July 2009 when the opportunity to own a franchise in their area landed in their lap. So, they purchased a territory and worked it part-time for 3 years. In August 2012, Steve sold his landscape maintenance company and they started running CitruSolution full-time. Since then, they purchased another territory, and they are now franchise owners in Monroe, Social Circle, Newton County, Morgan County, Lake Oconee/Putnam/Greene County. (Pretty much, they clean carpet from Salem Road in Covington, GA to Lake Oconee, and everywhere in between! ). Steve and Janis are excited about their work, the CitruSolution method, and connecting with people in neighboring areas. They are members of the Chamber of Commerce in Newton, Walton, Morgan, and Greene Counties, as well as the Lake Oconee Homebuilders Association. The #1 Carpet Cleaner in the Monroe Area! Now serving Greene, Morgan, Newton, Putnam, and Walton Counties. Call us at 770-286-9048!